A long time ago I was presented with a riddle that involved a war in the Middle East and went something like this: You take a hand-held calculator and add up or multiply this and that representing the numbers of opposing forces, tanks, aircraft, etc. Based upon the numbers given, you come up with 14,215,469. Then you multiply it by five (the number of days the war lasts) to come up with 71,077,345. Then you turn your calculator upside down (or look at the photo above) to see who won the war. After a moment’s thought, the answer is no surprise. But here’s another riddle. If Boise State, the University of Washington and USC had a game of musical chairs with their coaches, who would win? Well, they did. So turn your calculators upside down, because the answer is the subject of this week’s Three-and-Out. 1. Boise State. Chris Petersen had run up a record of 92-12 coaching Boise State, and when he took the head coaching job at Washington it looked like Sarkless in Seattle was going to be a bigger box office hit than Panic in Potatoland. But the Broncos replaced Petersen with Bryan Harsin and never missed a beat, going 10-2 in Harsin’s first year. Though Harsin came most recently from Arkansas State, he has strong Boise ties. He was born there. He went to elementary school there. He went to high school there. He played quarterback at Boise State. 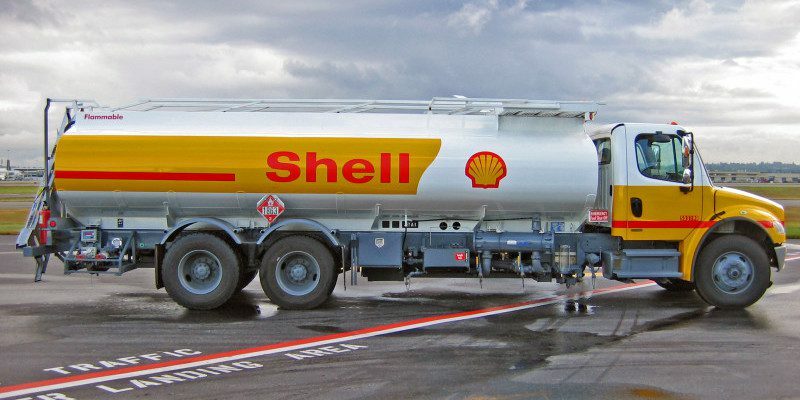 Not exactly what you’d call an outside hire. On the surface, it appears that the Broncos came out a winner … but did they really? Upsetting Pac-12 South champion Arizona in the most recent Fiesta Bowl, Boise State continues to be a spoiler, but the Broncos are still stuck in the Mountain West Conference, which had to be a major reason for Petersen’s departure. The Broncos will have a shot at a national title when they can get this field in natural turf. The last real hope for Boise State to make it to a Power Five conference before real turf is available in blue appears to be dwindling as the numerically challenged Big 12 conference with its ten members appears to be headed eastward rather than westward when it comes time to live up to its name. So, even under a new coach who is off to a great start, it appears that the Broncos will continue to hold the frustrating position of being the best of the rest. 2. University of Washington. Petersen didn’t exactly light things up in his first year in Seattle, finishing an 8-6 season with a 30-22 lackluster loss to Oklahoma State in the Cactus Bowl, after picking up an eleventh straight Husky loss to the Ducks, 45-20. And the Huskies only got an eighth win because they got a bonus regular season game against Hawaii, which they won (barely) 17-16. Maybe it’s as much about seven-win Seattle as it is about seven-win Sark. Chris Petersen ponders how to make Lake Washington visible from the playing field. But Husky fans should cheer up while they can, because things could be worse–and they undoubtedly will be. The Huskies are so hurting for returning starters in 2015 that their water boy will probably head the list. It’s a good thing that Husky Stadium is rated as one of the top venues in college football because of the view of Lake Washington. It gives Husky fans something pleasant to look at during football games. 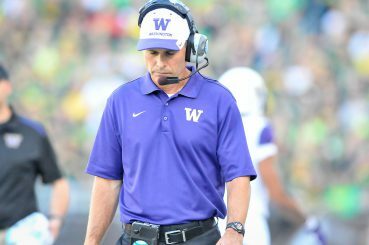 Petersen faces a much stiffer challenge at Washington than he did at Boise State. Many teams stand between him and breaking the program out of mediocrity, and the next one he faces is his old team, the Boise State Broncos, who open as 13-point favorites. 3. Southern California. So your marriage is on the rocks, and what do you do? You don’t move to just any community property state — you move to THE community property state where you are absolutely guaranteed to be taken to the cleaners. And you want to have it all handled discretely for the sake of the children, so just moving to California isn’t enough. You’ve got to move to Los Angeles, where they practically hand out Pulitzer Prizes to gossip columnists. 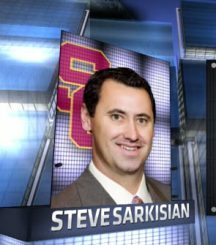 That’s what Steve Sarkisian did when he took the USC head coaching job, and some people actually believe that this is the brainpower that is going to lead the Trojans deep into the hunt for a national title. Good luck with that. In his first year at USC, Sarkisian did go 9-4, instead of his customary 7-6 at Washington, and he has a lot of talent returning, including QB Cody Kessler, who is really good at beating up on poor defenses but struggles against the better ones. Not that USC requires a messy divorce to be distracted. Even during the Carroll years, the Trojans could be counted on to have their minds either on Hollywood, the beach or maybe their NFL futures at least one game a year. So who wins? It’s hard to tell on the basis of just one year. Boise State doesn’t seem to have lost any momentum, but the Broncos are basically going nowhere, so it’s hard to distinguish between momentum and inertia. Washington and USC have expectations that are married to yesteryear, which is not such a good thing when you have a bare cupboard (Washington) or a coach who hasn’t proven much more than he can win seven games a year at Washington (USC). So the real winner in the scramble is the one that stayed out of the game of musical chairs–and has been smart enough to avoid that game since its last outside hire of a head coach in 1977. That was the year the Oregon Ducks hired Rich Brooks, and that remains the last time the Ducks looked outside their own staff for a new head coach. With some games it’s better to just be a spectator.